Glass and leather coasters can be engraved with the name of your company, a favorite company mascot, brand messaging, a commemorative statement to mark a special event, or just the company logo. With nothing more than a simple black and white image, Creative Laser Solutions can create unique party favors that will carry a positive message about your company from any event out into the world. See the Testimonials page to find out what kind of quality you can expect on coasters and other personalized items. Then contact us to find out how cost-effective this kind of brand management can be. Whether for corporate holiday gifts or personalized party favors, elegant glass coasters or sophisticated leather coasters will be appreciated. Beveled glass or ball-shaped from Creative Laser Solutions are another great way to not only send your guests home with something unique but also to promote what’s great about your organization. See your options here. Just select Ornaments and then select the type that interests you; you’ll see a full gallery of options and inspiration for these unique party favors, ideal for December soirees! If you would like to use the beveled glass ornaments we carry for your personalized party favors, choose from the following options, and remember we require a minimum order of 12. We also carry personalized christmas gifts. Once you’ve chosen an ornament shape, imprint style and the best font, if necessary, simply email your logo attachment to us with any instructions. 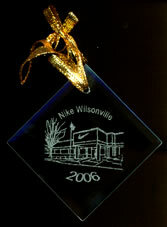 Scroll down the ornament page and you’ll find detailed instructions for ordering. We can insert text into the photo. If you plan to use an image taken with your digital camera, please set the resolution to the highest level since this guarantees the best-looking results. The more color, the better, and it’s a good idea to zoom in on your subject.